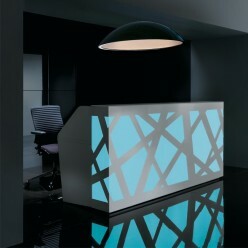 Small 1.6m wide reception counter with RGB LED front panels. The Cross-Thatch reception counters feature a distinct cross thatch style with rgb led lit front panels. Small reception unit includes controls for adjusting colour, intensity or programed colour cycling. Storage sold seperately.